Bite-Sized: Ferry | Wake up, Meeples! First, Ferry enables you to add a $5 action to your deck before turn 3, no matter what opening you have, and on a 3/4 opening you can even open with a $6 card. 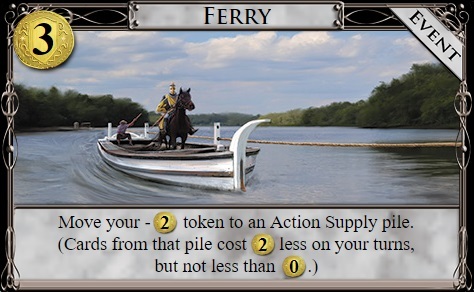 On top of allowing more cards to be opened with, expensive cards are more easily accessible as putting Ferry down reduces the price point you have to hit to access those cards; which is normally a huge limiting factor, especially for cards you want a lot of copies of. This is especially true for cards whose cost can be reduced to $4 or lower when appropriate gainers are around, but can still be useful on cheap cards, provided you have extra buys or gains in abundance. It can often be good to move your Ferry token after it’s already on a pile. It pays for itself pretty quickly with just two gains of the new card, provided that the extra buy wasn’t a big deal, and can be very useful for enabling 3-pile endings.